In a world so wounded by selfishness, violence, and the culture of death, conformity is not an option. Instead of being conformed, we are called to be transformed, to be raised up in the renewing transformation we call the Resurrection of Christ. 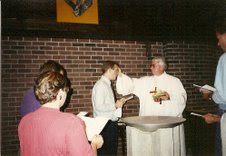 Here I am receiving the post-baptismal anointing with the Sacred Chrism, having been a neophyte for no more than a minute. That was sixteen years ago today. Trying to follow the Lord has been a wild ride; it's a good thing I didn't really know what I was getting myself into that day. Since then I've lived at seventeen addresses in six states and four countries. [One] must get accustomed to discovering the traces (vestigia) of spiritual things in bodies in such a way that when he turns upward from here and starts climbing (ascendere coeperit) with reason as his guide in order to reach the unchanging truth itself through with these things were made. De Trinitate, XII:5, translation of Edmund Hill, OP. In whatever way it seems good to you to please the Lord God and to follow his footprint (sequi vestigiam) and his poverty, do it with my blessing of the Lord God and my obedience. Letter to Brother Leo, my translation. For it is in harmony with our created condition that the universe itself might serve as a ladder by which we can ascend (scala ad ascendum) into God. Among created things, some are vestiges (vestigium), some images, some are bodily, others are spiritual...let us place the first step of our ascent at the bottom, putting the whole world of sense-objects before us as a mirror through which we may passs to God, the highest creative Artist. Itinerarium Mentis in Deum,, I: 2, 9, translation of Zachary Hayes, OFM. God of mercy, comfort those in sorrow, the tears of Saint Monica moved you to convert her son Saint Augustine to the faith of Christ. By their prayers, help us to turn from our sins and to find your loving forgiveness. Grant this through our Lord Jesus Christ, your Son, who lives and reigns with you and the Holy Spirit, one God, for ever and ever. I really think Monica is a saint for our time. So many times I hear from people about their sorrow and anguish at their children who don't go to church or seem to have forgotten about God. My own experience working in the parish confirms their complaint; each time I preside at a wedding and see the church filled with twenty- and thirty-somethings, I wonder where all these folks are on Sunday. Several times I've expressed my opinion here that this is the fault of our preaching and religious education cultures that teach religious behavior rather than portable spiritual practice and vague moral lessons to follow rather than Mysteries to be stepped into. But that's not the point. By Monica's prayers the grace of God saved Augustine from vanity, superstition, and concubinage. Seeing as these sins are flourishing in our society, our call to imitate Monica in prayer is clear. Monica is also the name of the Dell Inspiron 6000 I use for blogging and everything else. It makes the monastery network diagram look funny. Perhaps you will find this hard to believe about me, but yesterday I went to a Mass celebrated in the Extraordinary Form of the Roman Rite for the very first time. When Summorum pontificum came out, I thought that I should at least acquaint myself with it, given that under certain circumstances the faithful are now allowed to ask for it in their parishes. So I bought a new edition of the 1962 hand missal, and put the Extraordinary Form in my calendar for each Sunday afternoon. Yesterday I finally got around to going. First, the people were really dressed for church. Most of the men and boys had jackets and ties, and most of the women and girls were wearing dresses and chapel veils. Sundays are a lot more casual where I work! Second, I can see how this rite wasn't made for the sensibility of frequent communion. When each communicant receives the proclamation Corpus Domini nostri Jesu Christi custodiat te animam tuam in vitam aeternam it makes for a rather long process. Peter's confession of apostolic faith is the rock foundation of the Church of Jesus Christ. My homily for this weekend is posted here. This morning I'm trying to draft my homily for Sunday, and I get caught up wondering if "patient suffering" is a tautology. Today is the feast of St. Bernard of Clairvaux, one of the greatest lights in the history of religious life in the western Church. Whenever one of these great monastic saints comes around, I get to thinking about religious life. One of the great dissonances of my own religious life is that I have always seen my own Franciscan vocation within the context of the whole tradition of religious life, while many other friars seem to see our particular vocation as unrelated to the earlier, more monastic forms. How often I have heard the protest, "We're not monks." It's true, there are critical differences between the monastic and the mendicant forms of religious life. Stability and place have always been constitutive of monastic life in the Benedictine traditions, while the mendicant life is based on homelessness and itinerancy. The concept of religious poverty is very different as well. Monastic religious typically follow the vision of poverty found in Acts 2:45-46, in which all who believed held all things in common and gave to each according to need. Franciscans, on the other hand, are inspired by the vision of poverty associated with Gospel passages like Matthew 10:9-10, "Do not take gold or silver or copper for your belts; no sack for the journey, or a second tunic, or sandals, or walking stick." The first is the vision of a stable community which supports the individual renunciation of its members, while the second is a vision of an itinerant life without stable or reliable support. In practice, most Franciscans actually follow the monastic model of individual poverty within corporate security. What gets me about us is that the suggestion that we ought to follow a more strict or regular pattern of common prayer (up to and including what we have promised in our own Rule and Constitutions) is often met with the objection, "We're not monks." But if you then suggest that by that same logic we ought to reject the monastic model of religious poverty as well, along with the comfort and security it affords us, well then the real motives of the "We're not monks" brethren will come through. Sarcasm in catholic religious communities. How much time do you have, friend? unitarian homily baptism. How about this: In Matthew 28:19, Jesus tells us to make disciples of all nations, baptizing them in the name of the Father, and of the Son, and of the Holy Spirit. But you can't do everything, can you? So I baptize you in the name of...uh..I'm not sure. one of the things that I remember really puzzling me was "how do you pray". How do you get/ try to get connection to the divine. this was never really explained. This goes to the heart of what I worry about with "religious education" for both children and adults. It can be very hard to know how to learn spiritual practice in a way that can be owned and portable. It's easy to find a way to learn the data of the faith; it can be learned through a trustworthy director or it can be studied on one's own. It's easy to learn the words of the Our Father or Hail Mary, but to learn how to pray, that's another story. There are lots of books on prayer, many of which are nonsense, but they will seldom tell you exactly what to do in order to pray. I think this is partly because the concrete details and methods of prayer and spiritual practice depend a lot on personal temperament and state of life. In the course of my baptismal vocation I have lived as a lay secular, a lay religious, a lay secular again, a lay religious again, and finally as a religious cleric. My prayer life has shifted along with that. The course of this active religious life and ministry has made me a little more extroverted than when I was younger, and that has been reflected in my prayer as well. I began to learn to pray through a mentor, and I think this is a good method with a lot of support in the tradition. Early on in my religious life I made friends with a brother who was really into the Centering Prayer method, and he taught it to me. From there I was led to read The Cloud of Unknowing, St. John of the Cross (especially, early on, The Ascent of Mount Carmel) and finally the prayer conferences of John Cassian. These have remained my principal teachers from the tradition. Teachers of prayer are few and far between though, so someone who desires prayer has to be a "self starter" for sure. In this case I would recommend the use of a simple method to encourage the prayer of the heart and mind, beyond, beneath and above verbal prayer. Lectio Divina, Ignatian style discursive meditation on passages from the Gospels, or Centering Prayer are all fine choices. Run with the one that seems to grab the heart at first glance. There is enough written about all of them, so it should be easy for anyone to find something to read. Commit to a certain time and place for prayer each day, and do whatever rearranging has to be done to be faithful to it. The best contemporary introductions to the basics of the spiritual life I have ever come across are Beginning to Pray by Archbishop Anthony Bloom, Celebration of Discipline, by Richard J. Foster and Thoughts Matter and Tools Matter by Sr. Mary Margaret Funk. 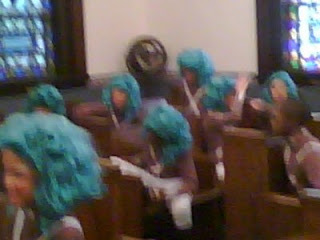 Heres' something you don't see every day: the monastery chapel filled with Oompa Loompas sitting in the choir stalls. It's blurry on purpose. This is from preparations for last year's school play. Whatever you doompadee doo, don't start Googling Oompa Loompas, because you will soon find the Oompa Loompa dating service, and I for one don't even want to know. When I went upstairs to get my cereal this morning (in our house the kitchen and dining room are upstairs, one thing among many that are backwards) one of the brothers had left one of the newspapers open to an article about celebrities and famous people who had dismissed their Catholic faith. Displayed were some of their sarcastic incredulities and criticisms. To me it just pointed out the sad fact that, from what I observe, many Catholics were simply never introduced to a faith that an adult could believe in. You can tell a child that there is such a thing as "God" or make them tell you that the Risen Lord is present under the appearance of bread and wine, but if that's all they ever have, of course they will reject and mock it when they grow up. Utterances like, "I believe in God the Father Almighty, Creator of heaven and earth," or "Take and eat. This is my body," are exceedingly complex and subtle, filled with a history of reflection on what it means to be a human being, what it means to exist, what it means to realize there is something rather than nothing in the universe. If someone only knows these things as data, they will soon be rejected as unbelievable or at least irrelevant. This is why I believe so strongly that everyday Catholic preaching needs to move away from a light moralizing on daily life that is functionally unitarian, and get into the central mysteries of the faith, in such a way that people can be helped to step into them. The story of faith is the great miracle of history. We have been "grafted" into the story only recently, but have received every blessing and good thing. My homily for this weekend is posted here. One issue that often weighs on me heavily is the catechesis for and administration of the sacraments of initiation for those who don't seem committed to their faith. This is especially difficult in the case of children of parents who don't give much visible evidence of faith. Situations can be very hard. Sometimes a grandparent pushes for the baptism of a child, but the parents readily admit their indifference. Sometimes a kid admits that she doesn't care about being confirmed, and a conflict between the parents and the catechists and clergy erupts. Sometimes people bring babies here from far away because this is their ancestral parish. When I ask what their parish is where they actually live, sometimes they don't even know. When I suggest that this is their opportunity to join the parish where they now live, get involved, and baptize their child there, a big fight typically ensues. These are ones that keep me up at night. So it really made my day today to see that Pope Benedict had spoken a little bit on the question, albeit informally. Check out his beautiful remarks here. In Christ we are offered freedom from being beaten upon and exhausted by the storms in our heads and the chaos of the world around us. My homily for this weekend is posted here. Today is the feast of Teresa Benedicta of the Cross, better known to history as Edith Stein. It's just about the only day when you can get both of these philosophers into one homily. One of my favorite things about the Franciscan life is that it is expressed in every state of life: secular and religious, lay and cleric, and every shade and combination among them. I really love the feast of the Transfiguration, and I've often reflected on it in these posts. To me it's just one of those very mystical feast days. In the same spirit I really love the Epiphany and the Presentation/feast of Candlemas. To me the Transfiguration reveals that the Resurrection is not a historical event but a transcendent force. If it were merely a historical event, how could this Resurrection appearance--and surely it is one--occur before the Lord's Passion? God makes use of the humanity of Christ to break into time and space. Raising this humanity to new life by the Spirit, this inbreaking arrives as the Resurrection of the Lord. It is the transcendent joined to the time and space of creation, or, more scriptually speaking, the marriage of heaven and earth. Today I was thinking about St. John and I realized for the first time that he would have been a little kid when the French Revolution started. All his little hagiographies talk about his obstacles and troubles in studying for the priesthood, and no wonder. The great celebration of the fulfillment of creation and history has already begun, and we're invited. My homily for this weekend is posted here.